The Obama administration estimates the bill will reduce total security spending by $420 billion over the next 10 years, with $350 billion or just more than 80 percent of those cuts coming from the Pentagon. But few of these cuts are specifically mandated by the bill. The debt ceiling deal does set hard caps on security spending for the next two years, limiting the security budget to $684 billion in 2012 and $686 billion in 2013. These reductions, however, amount to less than 1 percent of the security budget, which currently stands at $688.5 billion. The $350 billion figure assumes that Congress will voluntarily maintain similar caps on security spending through 2021 in order to meet the bill’s $1.5 trillion target for overall spending reductions. Given Congress’s terrible track record on reining in defense spending over the past decade, the likelihood that a significant portion of these cuts will never materialize remains high. Further, due to the debt ceiling deal’s broad definition of “security spending”—which encompasses funding for the Departments of Defense, Veterans Affairs, Homeland Security, and State, as well as the country’s intelligence agencies—Congress could potentially keep security spending within the caps without touching DOD spending at all, instead slashing the budgets of the other, already underfunded “security” agencies. Doing so would continue to overstate the proper role for the military within our foreign policy. After an unprecedented streak of 13 consecutive years of rising defense budgets, the United States is now spending more on defense than at any time since World War II and almost as much as the rest of the world combined. As the administration, Congress, and the Pentagon work to make good on the debt ceiling deal, they should focus on responsibly reducing wasteful military spending in a way that bolsters our economy without endangering our national security. A number of individuals, groups, and organizations from across the political spectrum have released plans over the past year to help combat the federal deficit by returning defense spending to more fiscally sustainable levels. Most significantly, Sen. Tom Coburn (R-OK), the Bowles-Simpson fiscal commission, the Project on Government Oversight/Taxpayers for Common Sense, and the Center for American Progress have all released reports that outline opportunities for controlling Pentagon spending. Despite the political differences among the authors, there is a surprising amount of overlap in the defense spending portions of their deficit reduction plans. 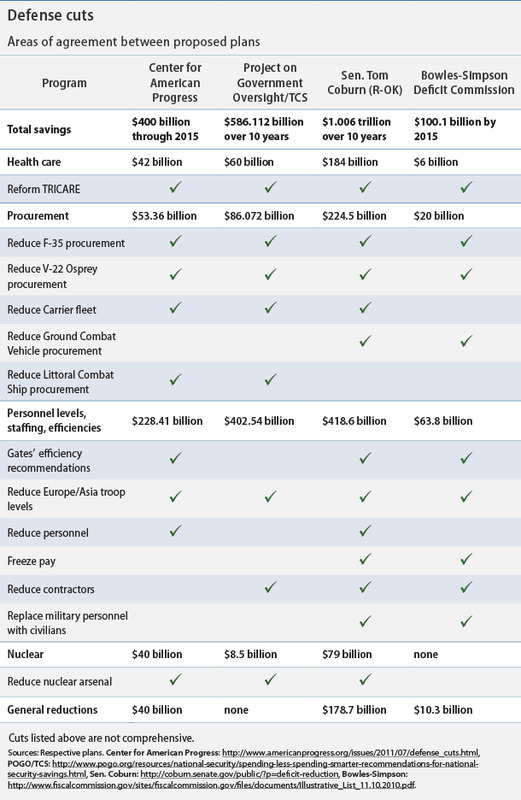 As the Pentagon and Congress begin to implement the $350 billion in cuts in the debt deal, this memo will highlight bipartisan recommendations from the four plans, shown in the following chart and described below. This March the Pentagon identified $178 billion in savings and efficiencies through fiscal year 2016, but it currently plans to reinvest $100 billion of these savings into new programs. The plans released by Sen. Coburn’s office, the Bowles-Simpson fiscal commission, and the Center for American Progress all suggest using a greater portion of these savings for reducing the size of the defense budget. Given the climate of fiscal austerity, these three organizations from across the political spectrum all agree that allowing the Pentagon to keep more than half the money they themselves have identified as wasteful spending would be extraordinarily irresponsible. Sen. Coburn suggests reversing the ratio and plowing only $78 billion out of the $178 billion back into the department, while our plan recommends using all of the savings for reductions in the baseline defense budget. The Pentagon estimates that in fiscal year 2011 it spent about as much on military health care as it did on the war in Iraq, so it should be no surprise that all four plans identify military health care as a principal area for savings. DOD’s skyrocketing health care expenses over the past decade can largely be attributed to the rising cost of health care for military retirees, whose premiums have not increased since 1995 despite rising health care costs. Our retired military personnel deserve access to top-quality, affordable health care for life. That said, by reinstituting a fair cost-sharing balance between military retirees, especially working-age retirees, and taxpayers, and by implementing provisions to reduce overuse and double coverage in the military health care system, we can save $15 billion per year while continuing to live up to our obligation to our country’s service members. Sen. Coburn, POGO/TCS, and the Bowles-Simpson commission similarly see reforming the military health care system as a top priority, identifying savings of up to $184 billion over the next decade from this area of the Pentagon’s budget. There are currently about 150,000 active-duty U.S. troops stationed in Europe or Asia. All four plans agree that this overseas presence presents an opportunity for savings. The Center for American Progress and Sen. Coburn both recommend cutting the United States’ troop presence in Europe and Asia by one-third, or 50,000 troops, for savings of $40 billion through 2016 and $70 billion through 2021. The Bowles-Simpson commission would cut our bases in Europe and Asia by one-third in order to save $8.5 billion by 2015, while the POGO/TCS plan proposes removing 20,000 troops for savings of $30 billion through 2021. Given improved U.S. capabilities for long-range strikes and rapid troop transport, the United States can protect its interests overseas without such a substantial permanent overseas presence. Moreover, our troops in Europe are essentially subsidizing the defense budgets of our European allies, who have been slashing defense spending significantly in order to address their own deficit woes, without significantly furthering U.S. interests. The size of the Army and the Marine Corps grew significantly after September 11, 2001, to support our operations in Afghanistan and Iraq. As we complete our drawdown from Iraq and begin our drawdown from Afghanistan by removing 33,000 troops by the end of the year, we can reduce our end strength numbers in the Army and the Marine Corps to reflect the fact that these two wars are winding down and that, as former Secretary of Defense Robert Gates noted, we will not be sending large ground forces into the Middle East anytime soon. Both Sen. Coburn’s plan and CAP’s plan call for such a step to be taken: Sen. Coburn claims the Pentagon can save $92 billion by reducing the Army size to 482,400, while we recommend that the United States reduce both the Army and Marines to pre-9/11 levels. Adm. Mike Mullen has stated that the unprecedented rise in defense spending since 9/11 has meant that the Pentagon has not needed to make any “hard choices.” But the United States can no longer afford to continue funding underperforming or unnecessary weapons systems. 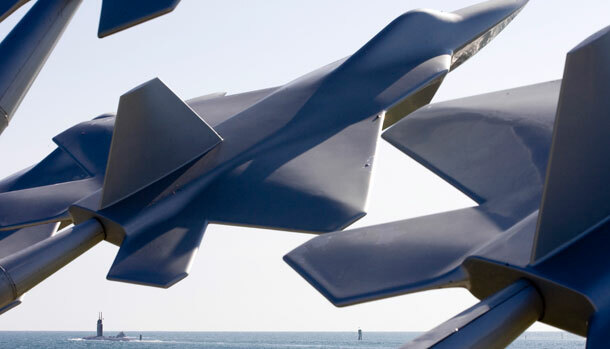 There is widespread agreement in all four plans on three specific programs where savings can and should be found: the F-35 Joint Strike Fighter, the V-22 Osprey helicopter, and the Navy’s aircraft carriers and air wings. All four plans recommend reducing the number of F-35s the Pentagon purchases, though they distribute the cut differently through the three services currently scheduled to buy the plane. All four plans similarly suggest reducing or canceling additional purchases of the V-22 Osprey, which has been on the chopping block since the early 1990s. And Sen. Coburn, POGO/TCS, and CAP all argue that the United States can retire at least one of our 11 aircraft carriers and corresponding naval air wings while still maintaining our overwhelming naval superiority. While New START has set the United States on a path toward responsible reductions in our nuclear stockpile, CAP, POGO/TCS, and Sen. Coburn have all identified further areas of our nuclear program that can be cut responsibly. The plan released by POGO/TCS emphasizes canceling several nuclear weapon construction programs and calls for downblending highly enriched uranium and selling it as low-enriched uranium in order to bring in revenue. Our plan as well as Sen. Coburn’s recommend significantly reducing the nuclear weapons force structure. Ours calls for a reduction of the nuclear arsenal to 311 deployed warheads—at a savings of $33.27 billion by 2015. Sen. Coburn’s plan advises a reduction to 300 deployed ICBMs, at a savings of $79 billion through 2021. The six cuts to DOD spending proposed in this memo represent areas of agreement among groups that span the political spectrum. While CAP and the other organizations mentioned all have identified further cuts that can be made responsibly, these six areas alone represent significantly more than $350 billion in savings over the next 10 years. Congress will soon begin debating the implementation of the first stage of deficit reduction, and the 12 legislators who will comprise the Joint Super Committee will soon come together to identify $1.5 trillion in future savings. These responsible defense cuts, promoted by groups left, right, and center, should be at the top of their lists. Lawrence J. Korb is a Senior Fellow at American Progress. Sam Klug is an intern and Alex Rothman is a Special Assistant with the National Security and International Policy team at American Progress.